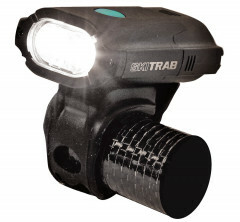 Ski Trab’s lightest headlamp is designed for 4 A.M. wake-up calls, Tuesday night races, or those afternoon ski adventures that don’t quite go according to plan. Weighing less than 100g, you won’t even notice the Sprint Lamp until you press the on button. That action releases all 800 Lumens from their cage, scaring unexpecting wildlife away. 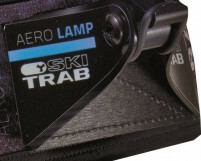 Trab chose enough battery to save your hide but also enough to get you into some trouble if you are prone to skiing more than your doctor or employer recommend. Aluminum housing with ABS plastic reinforcements ensure durable and shock-proof performance throughout the life of the light. The Sprint Lamp offers multiple attachment solutions, with the default option being the classic GoPro mount, giving you flexibility to swap it with your other important devices. The Trab Sprint headlamp is a powerful lighting source intended to be a versatile accessory that weighs as much as an emergency headlamp, but has the power and intensity of a much larger device. Two Cree XPG2 R5 LEDs are the brawn behind the Sprint Lamp. 1100mAh, USB-Rechargeable battery is the brains behind the Sprint Lamp. Four intensity levels at your disposal in this non-disposable headlamp. Built-in power indicator lets you know when it’s time to tone it down. Two-hour battery life at 400 lm, a good deal more at lower power. GoPro style elastic headband included, which can be worn in conjunction with a helmet. Compatible with GoPro adhesive mounts to allow you to swap mounts with your cam. What type of battery does this use? Can spares be purchased? Hi Aaron, the battery for this headlamp is a built in 1100mAh, USB-Rechargeable battery. As such, spares are not available, unfortunately. What is 13 + 4?